Stair Parts Questions? Call Us! 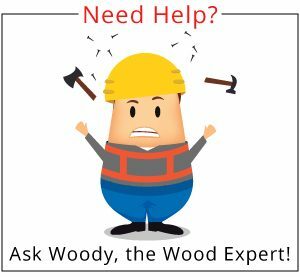 In an effort to provide our customers with the best tools available to educate and inform themselves or their customers we thought it important to discuss that upon which so much of the construction industry is based, wood. Any wood intended for use as building materials is called lumber and is generally milled into planks, boards, etc. Lumber is used throughout the construction process in limitless applications, from structural to protective, to decorative and beyond. However, the lack of detailed understanding of this perhaps most significant product of our industry, even by those claiming to be experts in this field, is amazing. Often it seems that a current trend is the driving force behind the selection of a particular wood species and that few people, even professionals, ever consider why one may be better suited for some uses as opposed to others. There are many properties that one might contemplate when determining which of the multitude of wood species to use for a particular application. These factors include aesthetics, price, availability, size limitations, ecological impact, hardness, dimensional stability, function, etc. In order to best evaluate these considerations, one must first have an understanding of this amazing and versatile medium in itself. 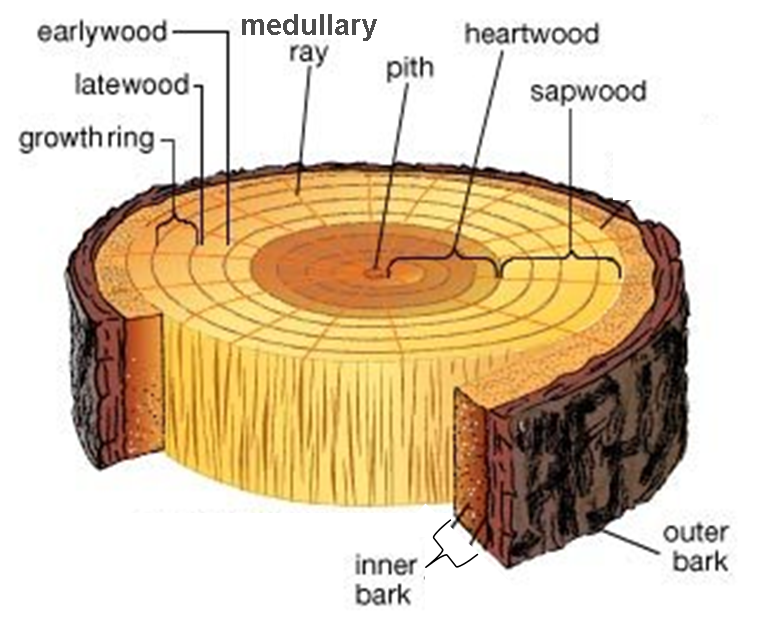 A cross section of a typical tree reveals the four clearly differentiated layers; pith, heartwood, sapwood and the cambium and bark layer. The first and innermost layer is the central core of the tree, known as the pith where most branches originate. Moving outward is the first layer of wood, called heartwood consisting of inactive cells. It is the older and harder layer of wood that is typically darker in color than the next layer known as sapwood. Heartwood often contains chemical and mineral deposits within the cells that make the lumber derived from this region more durable when exposed to weather than the sapwood. Sapwood is the outermost layer of wood. Younger and less dense, it is the living wood of the tree; its principal functions being the storage and transport of water from the roots to the leaves. Finally, the bark and cambium layer where all growth in thickness takes place by cellular division. New growth in trees occur s through the addition of new cells in this outermost layer, not the expansion or further development of existing wood already formed. The bark and the pith are excluded from finished lumber products. Two other characteristics readily identified in a tree cross section are the distinctive annual growth rings and the medullary rays. The growth rings are differences in the color and density of the wood that is produced during the growing season. The inner layer of a growth ring called “earlywood” is formed first while the outer more dense “latewood” is formed later. It is these rings, that when exposed in lumber, create a species distinctive patterns. The Medullary Rays extend radially from the pith outward toward the bark. The primary function of these rays is the storage and transportation of food horizontally through the tree. These cells produce the fleck or flake common in quarter-sawn lumber. Apart from these similarities, trees are divided into two groups, hardwoods and softwoods. While it is generally true that hardwoods are more dense than softwoods it is not always the case and it is not the basis for the classification. The distinction between hardwoods and softwoods is actually based on seeds and reproduction. Hardwoods are angiosperms whose seeds are protected either by a fruit or hard shell; for example peaches or pecans. They are generally broad flat leaved trees that shed their leaves during winter. They contain fibers called pores that run from the roots to the top of the tree to transfer water and sap. Hardwood lumbers are used prolifically in fine furniture, finish carpentry and flooring because of their often beautiful color, grain patterns and density. In the forest, hardwoods rely heavily on animals to spread their seeds so the trees are generally intermixed with a variety of other species. Softwoods, on the other hand, are gymnosperms whose seeds are not protected by an outer layer, although they may be grown in cones. They have no grain and so their density is much more uniform. Generally, softwoods are evergreens and commonly have needles. Softwoods are far less varied than hardwoods, though most products constructed of wood today are made from softwoods. Softwoods are generally less expensive because they grow faster than hardwoods. Also, since it can be replenished more quickly it is believed to be a more environmentally friendly option. In addition to inexpensive furniture, and paint grade finish carpentry, softwood lumber is used primarily as the structural and framing elements in home construction. categories are rough sawn and dimensional and the types of are plain, rift and quarter sawn. extremely difficult to match board to board. Finally, wood expands and contracts differently with respect to grain and because of the variation in grain pattern in plainsawn lumber, it tends to be less stable than riftsawn or quartersawn lumber. Riftsawn lumber is far more stable than plainsawn lumber because each board has the same grain pattern because the cuts are made perpendicular to the concentric rings. Because of the similarity of the grain pattern between riftsawn boards wood products made from this type of lumber have a more uniform appearance. Unfortunately, a lot of waste is produced through this type of cutting which results in the more expensive and rare nature of this type of lumber. Quartersawn boards are created by first cutting the log in to quarters and then making a series of parallel cuts perpendicular to the rings of the tree which yields less lumber than plainsawn but far more than riftsawn. The grain pattern of quartersawn lumber is relatively consistent and stable and may include fleck, flake or wavy designs that some find aesthetically preferable to the other lumber types. The two categories of lumber are rough and dimensional and are available because of the wide range of intended uses for each. Some lumber is left rough sawn, meaning it is simply cut from the log, dried, and then distributed to lumber yards for sale. This lumber, typically hardwoods, is intended for use in products that require additional shaping and millwork such as furniture, balustrade components, moldings, etc. 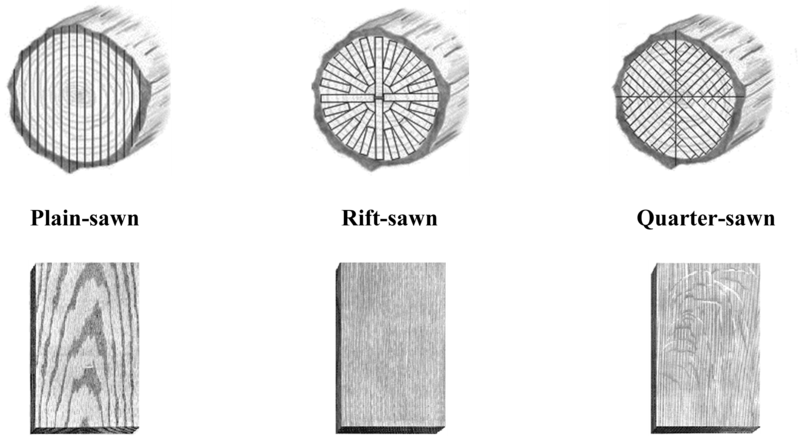 Rough lumber is generally sold by the board foot which is calculated by multiplying the Length by Width by Thickness (all in inches) and dividing by 144. (Formula: L × W × T ÷ 144) Rough lumber is generally sold in terms of its rough thickness as described in quarters, for example, 1” thick material is 4/4, 1 ½” material is 6/4, etc. Of course, when it is further milled the final dimensions will be somewhat less as described in the following chart. Dimensional lumber is a product of a sawmill that has been sawn, planed and finished to standardized thicknesses and widths. Dimensional lumber products are typically softwoods that are intended for use in framing construction and are sold by the linear foot or by the piece. They are labeled according to the original dimensions before shrinkage during the drying process and planning to their finished size. This is why a 2×4 is in fact 1 ½” x 3 ½” as shown in the following chart. exterior applications. Also, wood is constantly releasing or gaining moisture based on the relative humidity and to a lesser extent, temperature of its environment. In so doing it may shrink, expand and/or deform as it naturally equilibrates. This has more to do with preparation and care than selection. 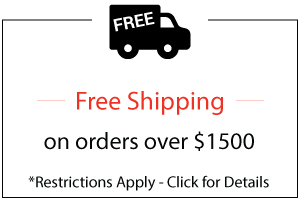 Generally, lumber destined for the manufacture of flooring, trim, cabinets, furniture, etc. is carefully kiln dried to a moisture content of 6 – 8%. This is because a temperature of 70º Fahrenheit and 35% relativity humidity are the conditions that are comfortable and typical of interior environments. It is for this reason that an EMC of 6 – 8% is ideal for most interior applications as the chart below reveals. However if conditions vary from the typical the lumber must be carefully acclimated before milling, manufacturing or installation to avoid degradation or movement. The hardness of a wood species is a critical consideration of its function. 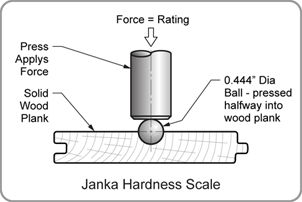 With this purpose in mind, the Janka Hardness scale was developed as the industry standard for judging a species ability to withstand denting and wear. In the United States, the scale is expressed numerically as the pounds per square inch required to sink a steel .444” diameter ball half its diameter into the wood. The higher the number, or pounds per square inch, the harder the species. This is an extremely useful tool when considering a species for applications such as flooring, for which ratings of 1000 or less, as an as an example, are generally not recommended. 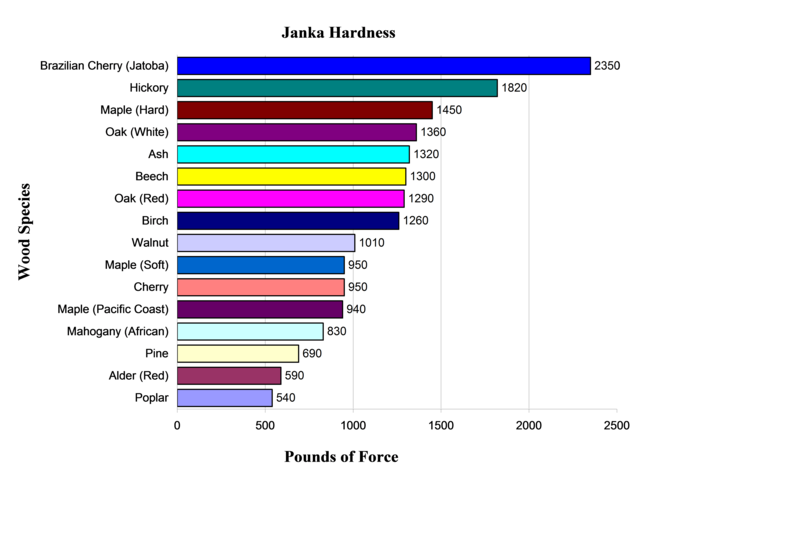 The following is a chart indicating the Janka ratings of some of the most commonly used hardwood species used today. Wood is one of our most valuable and prolific natural resources. Whether or not wood is considered a renewable resource is based on the species. A resource is generally considered renewable if it can be regenerated within an average human lifespan. Most lumber products fall easily within this range and are therefore highly renewable in the fact that when a tree is cut down another can be planted in its place that will grow to maturity in less than a hundred years. This is called rotation and ensures the sustained survival of the forest. In fact, the United States still has 70% of the forestland that it had in pre-colonial times and has maintained them since around 1900. There are however many forests that have been endangered through deforestation and some species of trees, especially some rainforest varieties, can take several hundred years to grow to maturity. A little research into the species and its origin will reveal the impact its removal is having on its ecology and the rotation practices in place. It is as much the responsibility of the consumer as the forester to ensure these resources are protected through education and conservation. The cost of lumber is generally influenced more by the cut method and grade than variety. For example, the low yield of rift sawn makes this type far more expensive than the same species of lumber plain sawn. In addition, a clear-pine board may cost more than a piece of walnut that’s filled with knots and imperfections. This is due to the fact that grading is based on the number of imperfections or defects per board. Knots, scars left from branch growth, are the most common defects and the “Select” grade of boards are virtually knot-free, and as such, they are the most expensive. Boards with knots are called “common” and are divided into levels #1 – #4. #1 and #2 common boards have “tight” or closed knots which do not reduce the structural integrity of the board and are merely aesthetic imperfections. #3 and #4 common lumber contain the most imperfections such as open knots, insect damage, rot, etc. These boards not only have visual imperfections but are generally not structurally sound. While it is true that the select varieties of lumber are generally preferable, there are applications where knots may be desirable in certain, perhaps rustic, applications according to the desired aesthetics of a project. Aesthetics The visual appeal of wood is as varied as the people upon whose opinions it is based. Many lumber products can be selected with no concern for aesthetics at all, such as the framing elements of a home. Aesthetics only become an issue when the wood being evaluated is for a finish application. It is often the case that this is the first consideration that is made, and rightly so because so much of woods function in our lives is in the appreciation of its beauty. So it is with this in mind that one should first define the desired visual effect and then seek to identify the best candidate species based on the many varied characteristics available. 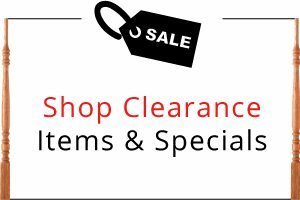 Copyright © 2019 WoodStairs.com - Stair Parts & Supplies. All Rights are Reserved!